Dennis Lehane, the author of Mystic River and Gone Baby Gone that were famously adapted into award-winning films with amazing ensemble casts, brings us another adaptation of one of his short stories called The Drop. Teaming up with Director Michaël R. Roskam, they deliver a film that in many ways has the same feel to it as those other crime dramas but is significantly less disturbing than the two mentioned above. The film takes place in a gritty part of Brooklyn where the local watering hole doubles as the occasional “drop bar” for the city’s thugs and their money. Tom Hardy plays bartender “Bob” who just tries to keep his head down and his nose out of everyone’s business but his own. The late great James Gandolfini, in his final role before his unfortunate death, plays “Cousin Marv” the bar’s acting manager who now answers to some mean Chechens after losing ownership of the bar some years ago. Things start going wrong when the pair are robbed early on in the film, and the rest just follows from there. There isn’t much to the film in terms of plot but it never feels that way. We follow Bob as he rescues a Pitbull puppy and takes on the responsibility of being a dog owner with the help of a woman played by Noomi Rapace (Prometheus, The Girl with the Dragon Tattoo). As usual, Tom Hardy all but disappears into the character. He’s quiet, calculating, maybe a little naive, and yet it always seems like there’s something else hiding behind his sad puppy dog eyes and small smirk that makes a very rare appearance on screen. Noomi Rapace is equally as good as a woman with her own secrets. It’s a slow-burning film but it never loses your interest as you try to piece everything together. The odd scene will actually generate some laughs, or at least some chuckles, and are mostly brought on by Bob’s tell-it-like-it-is attitude, which also makes him the only truly loveable character in the film, next to Rocco the puppy of course. 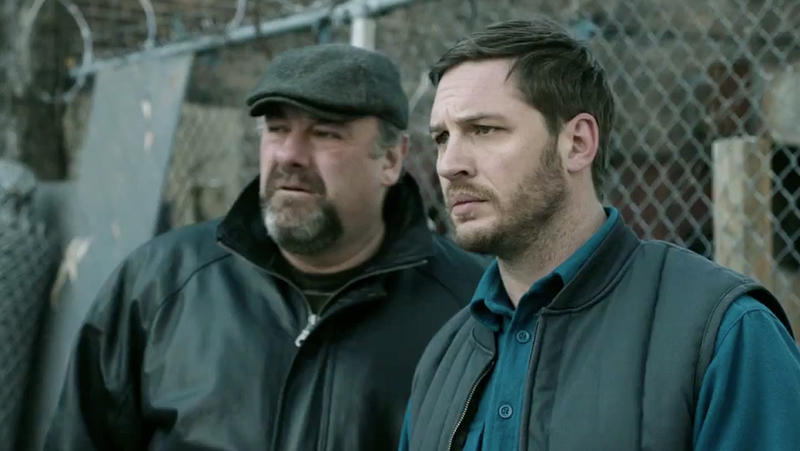 The Drop is a drama through and through but there is enough intrigue and there are enough moments that lighten the mood in order to sustain most viewers, even those who typically prefer more action to dialogue. It is possible, however, that some will find it a little too dull and seriously lacking in the shoot-em-up department. So those people looking for a lot of action and a true crime thriller will be a little disappointed but will likely still enjoy the film because as a viewer you really do want to find out where the story is going and how everything turns out for each character. Whether you notice it or not, you’re invested.